In Windows 10, click the small search icon (magnifying glass) in the bottom-left corner of the screen and type: "Default programs" and then hit enter. Windows 8: If you're using the modern metro interface, then just start typing "default programs" and you should soon see the icon for the program. If you're using the desktop version, then take your cursor to the top-right corner of the screen, menu opens and you can search for the program there. Windows Vista and Windows 7: In the Start Menu search box type the word default and then click on the first result. 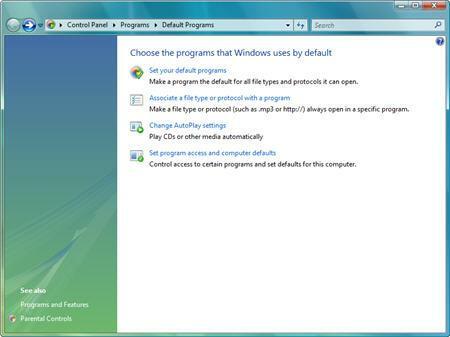 The Default Programs main window will open and you will see four options. Click on the Set your default programs link. After a short Loading... screen you will see a list with all the programs that you can configure. Here you can set a program as default for a specific file type, extension or protocol. Let's pick Internet Explorer as an example. Click on it and on the right side of the window you will see a small description of the program. Lower, there is a note that informs you if the program is set as the default for all the file types and protocols it can open. 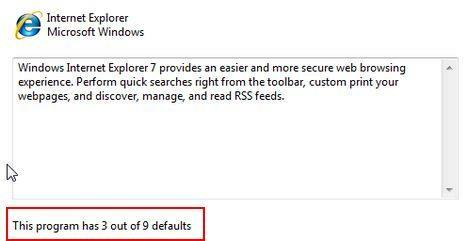 As you can see, for this example, Internet Explorer is set as default for 3 out of a total of 9. If you want to set this program as default for every file type, protocol or extension it can open, click on the Set this program as default link. When you have finished, click on OK. If you want to edit what file types a program will open by default, select it and then click the Choose defaults for this program link. A new window will open where you can set the program associations. 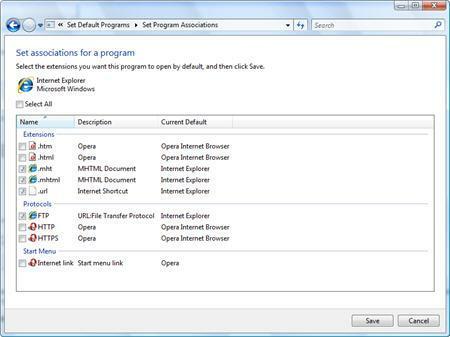 Here you can see all file types, extensions and protocols that Internet Explorer can open by default. If you want Internet Explorer to be the default for a specific extension or protocol, check the appropriate box right next to it. After you have made your selections click on Save and then on OK.
Next, when it asks you to install standard or custom, pick custom and leave the checked marks things alone. At this point, mozilla should be on the list. (make sure to have the programs set as custom not non-microsoft or microsoft). Now, uninstall firefox and install the standard way. Now if you are wondering why you click a link on AIM or MSN and it goes internet explorer. select firefox on the default programs and say set as program as default. that will allow the protocols to change. Now go on the internet one and see what defaults it has. For me it was 3/9, html,mhtml, and url. Now go back to the default programs page and click the second thing changing assosiate something something with a program. Now those programs that internet explorer has, manually set them to firefox. Now reboot your computer and this should work. this is great, thank you. i just got a windows vista and it's very different from all other windows models. How do you add programs to the list? Firefox will not show up in the choices to make . How can i add it ? In the upcoming days I will write a tutorial about how to add different programs to the list. If you're referring to the new tutorial at https://www.wintuts.com/set-program-access-computer-defaults that sort of doesn't really answer the question... Not for me, anyway. Sure, you can "enable" and "disable" access to Firefox, Opera and Internet Explorer there, but I don't see that you can add a program to the list. I have quite the collection of browsers, and "Firefox", "Opera" and "Internet Explorer" is not in my eyes as much three programs, as three version trees. The other day Windows Vista decided that default: Opera means Opera 7 and Opera 9 stopped being the default. Now I can transfer the "default" status between Firefox and Opera 7, but I want to specify a program that is not in the list - Opera 9. I can only assume the same problem would be there if you have Firefox 2 and Firefox 3 installed side by side. And what about my other browsers that aren't even listed? I realize that I am not a beginner and thus looking for answers at the wrong place. But this was the closest to an answer I could find on google. So, is there some way that we can add (and remove) programs from this list? I won't uninstall Opera 7 but I won't have it as my default browser either. can you please post how to add programs to the list ASAP? djb, I know that tutorial doesn't solve anything, I wasn't referring to that one. Unfortunately, I didn't had time to write the tutorial for adding programs to the list, but I did some research, and it seems that the only way you can easy add programs to that list is by using the "TweakVI Ultimate" application, witch is a payed only application (€34.99 / $49.99 / £24.99). I'll keep searching for a simple and free way of adding programs to the list and then I'll write a tutorial. Yes, please I'm another person who would be very keen to discover if there is a non-$$ way to add programs to the list. I see lots of people asking that question in various forums, but no answer as yet! thank you sooo much it worked!!!!! All the checkboxes are subdued... can't do anything! I can go and see what I would LIKE to modify, but none of the checkboxes are active. Load up the "Associate a File type or protocol with a program" instead of "set your default programs". Now you can sort by program used. Find all the things that are set to open in IE and you can now manually set them to something else if you want. You'll find more things on that list than the other, so you might be able to address a certain issue directly. what is a default program and why do i want to use it explain to me the reason for default please. You will notice a selection to create a desktop icon. 3rd if you check our last screenshot you can see that there is a section for Protocols and the 1st one is FTP. Apparently I did somthing wrong, because for all my programs, the default program they open with is the same. I don't have a clue how to fix it. Any idea whats wrong? - So how can I actually add a program to the default programs list? Awesome tutorial, however, I am NOT ALLOWED to change preferences(windowes 7) which are automatically selected in what is "Set your default programs" panel....I can either select all or keep whatever was there selected for me by programs when installed. Have any clue on how to change that option or those have to be completely uninstalled what consequently means to loose as well all my video and audio equipment(I assume) !!? It got really tricky after installing video converter vlc as one doesn't allow me to even create video files as pleased etc...just unbelieved. I would appreciate if you can think of something and give me hint. Thank you. I am trying to figure out how to associate my Yahoo mail account to Firefox because right now, if I try and contact someone from within Firefox, I get a pop up error message that says I have no email associated with the program. When I went into Default Programs, Yahoo Mail was not a listed choice.